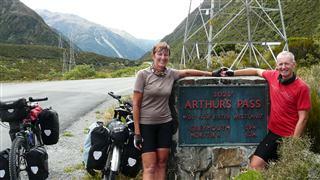 My Bicycling Adventure - Achieve your bicycle touring adventure. Do You Dream Of A Great Bicycling Adventure? At My Bicycling Adventure we aim to help you in realising your dream of undertaking long distance bicycle tours and adventures. 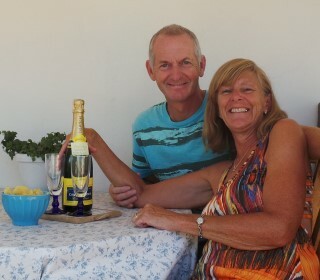 We are Karen and Steve Coulson and in August 2009 we sold our home and belongings, setting off to tour the countries of the World by bicycle. Over time, what originally started as a plan to cycle around the World has evolved into a life style to support this aim. We are not fanatical keep fit types or professional racers and neither are we young, athletic adventurers doing their "gap year". Our bicycle adventures are interspersed with periods of rest and relaxation as well as with periods of fulfilling work that enable us to continue to travel and see the World. Many times you will find us on the road in remote places like southern China, or Australia. On other occassions we may be doing a spot of house sitting, nursing (in Karen's case) or property development. No matter what, all of our activities are devised to enable us to continue cycle touring as finances and our health allow. No matter what your dream is or what your circumstances are you could do it too. We will show you how to prepare, plan, finance and facilitate your tour. We'll talk about the equipment you will need and compare different pieces of kit to help you choose. We'll inspire you with the bicycling adventures that we have undertaken and you can also contribute to our web site with your own thoughts, fondly remembered cycling tour or ideas for the delectation of other budding, bicycle touring adventurers. So why not spend a little time. Peruse our Bicycling Adventure site and see for yourself how we are achieiving our dream and how you can do too. Having been on the road on and off for the last five years, we have now decided that we need a bit of stability. So we now find ourselves in Portugal's wonderful Algarve region. This is the place that we have realised we want to settle in and are currently looking for a house to buy. Does that mean we are stopping cycling? "Heck no". We are just not going to be doing the continuous riding that we have in the past. We will continue to add to our ride pages and build other parts of our site. For any bicycle tourists out there that are riding through the Algarve and need a place to stay for a few days, you can find us on Warm Showers. You don't have to go to the extreme lengths that we have. The world of bicycle touring is still within your reach. Whether its a short term organised tour or long term independent travel, its our hope that our web site will inspire and help you to live your Bicycling Adventure too. There are many providers of bicycle tours around the World that can provide fully supported bicycle tours wherever you want to go. Everyone has their own preferred way to travel. For us, traveling by bicycle means that we can move that bit quicker and see more in the time available, yet travel slow enough to take in as much as possible. On a cycle tour you get a closer interaction with the people you meet. You can take your time to visit places and spot things that you wouldn't otherwise see. We love food (eating it not cooking it). The exercise we get from cycle touring most days, means that we can eat and eat and eat. What could be better. At the end of each day we get a great sense of achievement and look forward to seeing new people and places the next day. Our opinion? 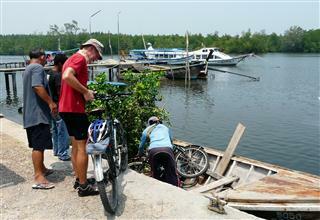 - Cycle touring is the best way to travel. Let's turn that on its head. Where can't you cycle? In fact there are few places where you can't. There are many factors that will determine where. How much time do you have? How do I feel about this particular place? How fit am I? How much money do I have? etc. Through this site we give you an insight into our own bicycling adventure tours and those of others to stimulate your thoughts. Why not check out some of our bicycling tours. Yes you can! How can we be so confident in saying that? Well when money is limited, its a question of "cutting your cloth to fit the suit". Depending upon your budget you can go on a short term fully supported cycling tour doing a few kilometers per day and staying in boutique hotels or use low cost travel options such as couch surfing; work in return for food and accommodation or even make money from your web site like we do. Alternatively read The 4-Hour Work Week: Escape the 9-5, Live Anywhere and Join the New Rich by Timothy Ferris. It will change the way you look at work forever. Money really does have to be not an obstacle to fulfilling your bicycling adventure dream. Look at our pages on Finance. People often say to us things like "I couldn't even ride to the shops let alone a cycle up mountains" or "I'm too old to do that" or "I couldn't give it all up like you guys have." Well the good news is you don't have to be super fit nor do you have to be a twenty something. We are in our fifties, have not been fanatical cyclists all our lives nor been particularly athletic. You don't have to go for months on end. You can just go on short term tours, independently or supported. You have the ability and only need to adopt a positive mind set that says "I can". Start slow and easy. You get much fitter over time. You feel better and fitter both mentally and physically. You'll never again have to go on a diet and before you know it you will experiencing your own bicycling adventure. Have a glance at our Health page. We don't take any supplements or anything like that. The only luxury we allow ourselves when it's available is Powerade. It helps to keep you properly hydrated. Unfortunately its not available outside of most western countries, or at least we haven't found it. That's where our My Bicycling Adventure can help. Specific pages on financing your trip, health, planning and equipment guide you along the way. Our cycling tour pages will stimulate your senses to drive your ambition and to see what we are up to month by month, have a look at our cycling blog. There is plenty of useful information on our Planning page. If we are preaching to the converted why not provide the benefit of your own cycle touring experience to others by adding to this site. There is nothing better than the diversity of other peoples bicycling adventure experiences. If you have a favourite ride, story to tell or information to impart why not submit it to us for inclusion on the site and to promote cycle touring to others.